Another product HoldTheCarbs.com offers is theirLC-Thick’n Potatoes Mix. 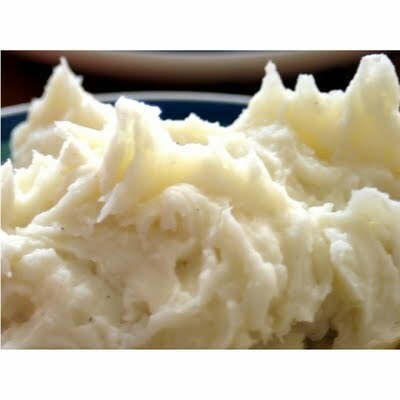 Picking up where Thick’n’Thin left off when they stopped producing for private sale, this product, added to mashed cauliflower, thickens things up in short order, for a thicker, meatier side dish. The product does what it promises, making mealtimes and those, “Is this mashed cauliflower?” side eyes from the kids less obnoxious than normal. On stove: Boil water. Add frozen cauliflower and cook until flowerettes are extremely tender, between 6-8 minutes. Pour off excess water. In microwave: Place frozen cauliflower in a 4-6 quart covered, microwavable container. Cook for 8 minutes, or until cauliflower is steamed and extremely soft. Pour off excess liquid. Throw the cauliflower bags away if you’re trying to steer kids to not ask questions about the ‘potatoes’ (it’s our secret). Place cooked cauliflower in blender. Add sour cream, butter and Thick’ nStarchy. Blend, stirring occasionally (do not stir contents with tongue). Serve with gravy* (see below). You can place bowl of piping hit goodness next to a prepared bowl of whole cauliflower. Kids may steer away from the cauliflower and grab what they think are the mashed potatoes! *tapping my head* This is because we’re smart, and sneaky. Negative: I can’t think of one at this time. Disclosure: Even though products were provided free of charge for review by a site sponsor, reviews have in no way been influenced, either positively or negatively. What else could you use instead of “LC Thick and starchy”? Would it be OK without? maybe some sort of cream? I just wanted to say how much I love your blog! It has inspired me so much to eat healthier and really incorporate vegetables into my meals. Hi, taylie! You could use cream cheese instead. It’s delicious and contains gums. You could go without a thickener, too. Thanks so much for your kind words! That I’ve inspired you to eat more veggies makes me happy. how much cream cheese would you use in lieu of the LC thick n starchy? want to make sure i dont put too much or too little making this for my dad for thanksgiving since he has to be clear of sugar and low on carbs… thanks for your help! Hi, Steph! I would start with 2 ounces of cream cheese for a batch, and then taste as you prepare. The cream cheese should also lessen any need to add milk, which contains lactose, so the cream cheese (use full-fat) will also be slightly more filling and should have less of an impact on blood sugar than milk would. I think that if you cook the cauliflower until you can mash it with a fork and incorporate your favorite seasonings, butter and heavy cream, you are going to be pretty happy. Cauliflower does have a slight pungency to it that garlic powder/salt can help mask, but I find it’s sometimes best (especially with the super tasters) to divulge that you’re serving a cauliflower mash/puree in the interest of disclosure. That said? It’s great stuff.